Day two of the Meet of Champions, today the best girls in the state go head to head. You'll find the event updates below as well as some related links including our full Group Championships coverage. The ladies from Ridge pulled away early and won this race handily, running a new NJ #1 and US #2 9:14.47 That time is also a new facility record. Coming up to take second place was the team from Seneca in 9:33.35 followed by Pope John XXIII in third in 9:35.04. 2016 US Olympian and NJ Legend Sydney McLaughlin of Union Catholic wins her third straight Indoor MOC 400m crown, running 53.17. 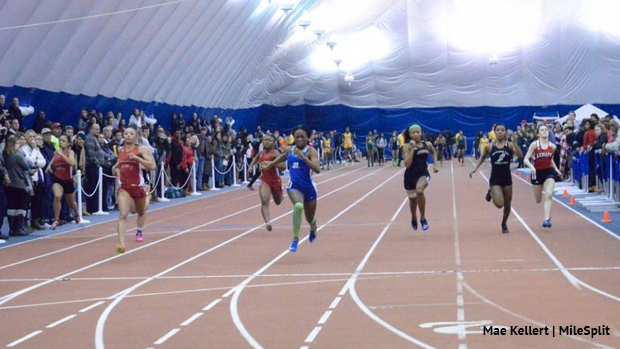 That time is a US #1, NJ #1, and a new meet and facility record. Taking second was Aliyah Taylor of Rancocas Valley in 56.24. A photo finish! What an incredible race we just had between Briana Gess of Haddonfield and Elena DiMarcello of North Hunterdon. Gess led for much of the race with DiMarcello just a step behind. They then engaged in an epic battle during the last lap, with DiMarcello making a strong move and taking the lead with about 150m to go. She held her one-step lead coming into the final 50m, but a final surge by Gess in the closing steps gave her the narrow victory. Gess only reclaimed the lead just before the finish line, resulting in a crazy photo finish in which Gess only won by .01! Gess ran 4:59.04 to DiMarcello's 4:59.05. Their times are NJ #1 and NJ #2 respectively. Taking the lead with 400m to go and holding off the field to take the win in 2:13.63 is freshman Victoria Vanriele of Governor Livingston. She held off 2016 800m Outdoor MOC winner Lexi Del Gizzo of Tenafly to get the win. Del Gizzo ran 2:14.74 for second place. Taking the win and dipping under the 25-second barrier is Aliyah Taylor of Rancocas Valley. Her time of 24.94 is also a new meet record and a new facility record! Taylor also placed second the 400m earlier. Running away to a commanding victory is Lenaami Morton of Camden. Morton's time of 7.94 is an NJ #1 and a US #4. Taking the win in 6.99 seconds is Bria Mack of Williamstown. Mack was the only athlete to dip under the 7-second barrier. She was followed closely by Iyanla Kollock of Our Lady of Mercy in 7.00. Taking the lead midway in and never looking back on her way to victory is senior Niamh Hayes of Howell. Hayes pulled away Mainland's Alyssa Aldridge over the final mile to secure the victory. Hayes' time of 10:31.98 is a US #6 and NJ #1. Hayes' time is also the third best in meet history. Aldridge, the 2015 and 2016 Cross Country MOC winner, settled for second in 10:40.70. Powered by an incredible anchor leg from the one and only Sydney McLaughlin, the team from Union Catholic wins their third straight Indoor 4x400m MOC title. McLaughlin brought her team back from ~30-50m deficit on the anchor leg to give her team the victory. McLaughlin turned on the jets the final 100m to pass the team from Winslow, who had led much of the race. Union Catholic ran 3:50.82 followed closely by Winslow in 3:51.49. Union Catholic's time is an NJ #1 and US #7. Winslow's time is an NJ #2 and US #10. McLauglin had an unofficial split of 51.98 on the anchor leg. Taking the win via jump-off at 12-00.00 is Julia Dannenbaum of Pingry. Dannenbaum won in a jump-off over Jessica Ippolito of Fair Lawn. Dannenbaum placed second in this event at this meet a year ago. Winning via jump-off at 5-06.00 and defending her title from a year ago is senior Courtene Campbell of South Brunswick. That jump ties her with a number of other athletes for the top jump in the state this season. Taking home the gold is the one and only Alyssa Wilson of Donovan Catholic. Her throw of 55-02 is a new meet record. This is Wilson's first ever Indoor MOC title.